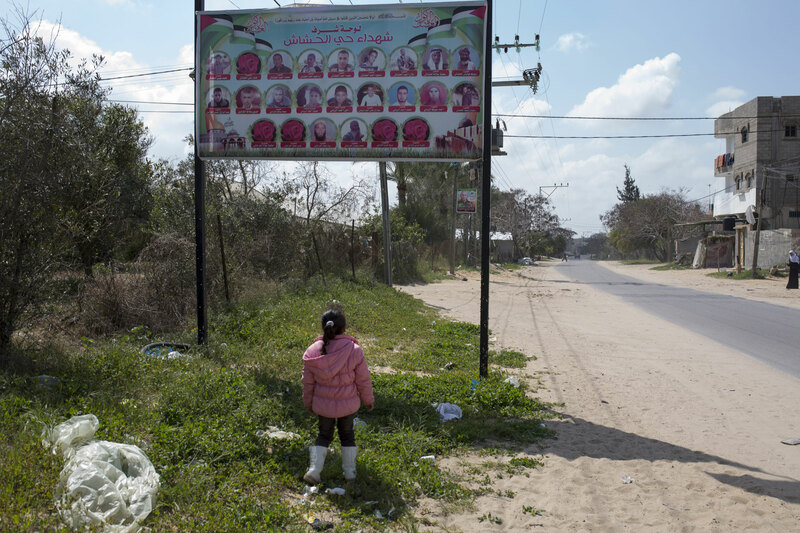 Every morning, on her way to school, Mina passes a poster on the side of the road. She makes sure she walks right by it. If anyone is in the street, she will grab their attention and pull them close to look at the poster with her. It has pictures of her brothers, and a rose instead of a photo for her step-mom Hanaa’. Neighbours or passersby have to stand there as Mina names each one of them; once the ritual is done, she will allow them to leave. Ahmed al-Hashash was the knot that tied everyone together. He is a deeply religious man. He was married to three women, Amina, Hanaa’ and Amna, and they had twelve children. They were a big family. Amna and Amina will say later that they were warm, caring and supportive of each other. “We were all one,” says Amna; the polygamy did not get in the way. Ahmed’s boys made him particularly proud; they were doing great at their schools. Like many Palestinians, he valued education above all else, and obtaining one while in a permanent state of displacement is no small feat. 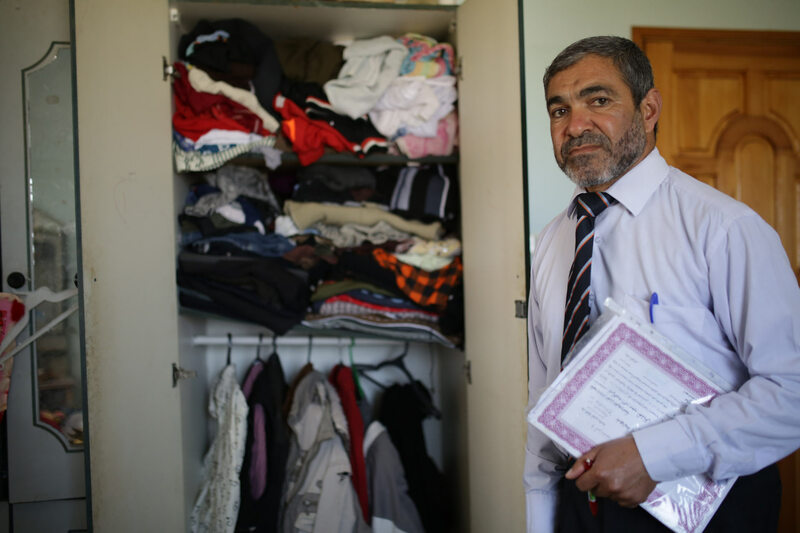 Ahmed is also the deputy director of a school run by UNRWA, a UN agency that delivers services to Palestinian refugees; he was a proud father and a teacher. Many of the women and men of the family were community activists. 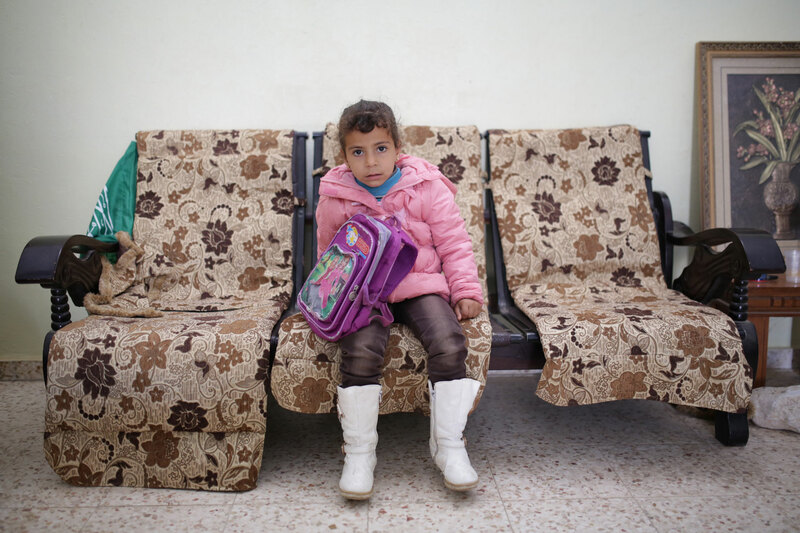 There was Hanaa’, who opened the first kindergarten for the kids of the al-Hashasheen neighborhood in Rafah, where the family lived. With time, the kindergarten grew into a center for community organizing and women’s empowerment. Her stepson, Bilal, worked as an intern lawyer, helping people resolve their issues with local authorities. Mohammed, Hanaa’s son, although disabled in a car accident, organized a football team for the neighbourhood kids. “They were like a team when it came to helping others in the tough situations in our community. People feel like they’ve lost half the youth of the neighbourhood,” says Ahmed. "They were like a team when it came to helping others in the tough situations in our community. 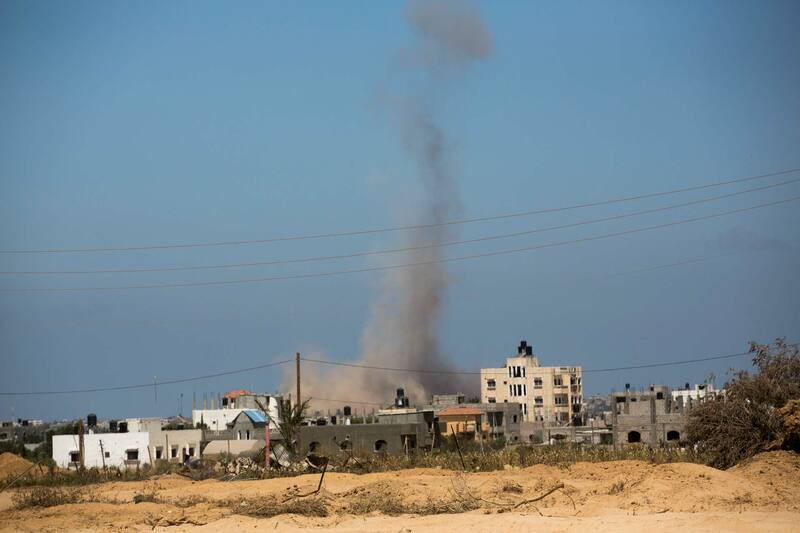 People feel like they've lost half the youth of the neighborhood"
Israeli bombing of Rafah area. Photo taken the 3 August 2014. “We must be prepared for a prolonged military operation in Gaza,” said the Israeli prime minister, Benyamin Netanyahu. He was giving a speech to the Israeli parliament, the Knesset. 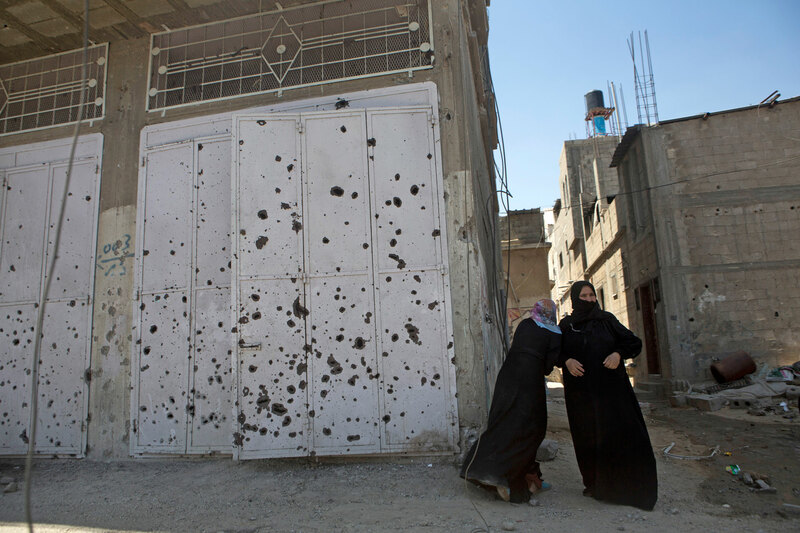 It was the end of July, halfway through the Israeli invasion of the Gaza Strip. His speech was televised in Gaza too. Those who had electricity watched warily, instead of celebrating the end of Ramadan and the first day of the holiday of Eid al-Fitr. “We knew that there would be difficult days; this has been a difficult and painful day,” Netanyahu continued, speaking slowly, pausing so that each word could sink in. His voice emanated from the TV set in the al-Hashash household, sporadically interrupted by the sounds of explosions drawing nearer and nearer to their neighbourhood. People fleeing their homes in the southern end of the Gaza Strip during the 2014 offensive. Hanaa’ had enough of it, and that meant a lot because everyone knew her to be of the strongest kind. She went to sleep early and told Amina she wished she would never wake up. 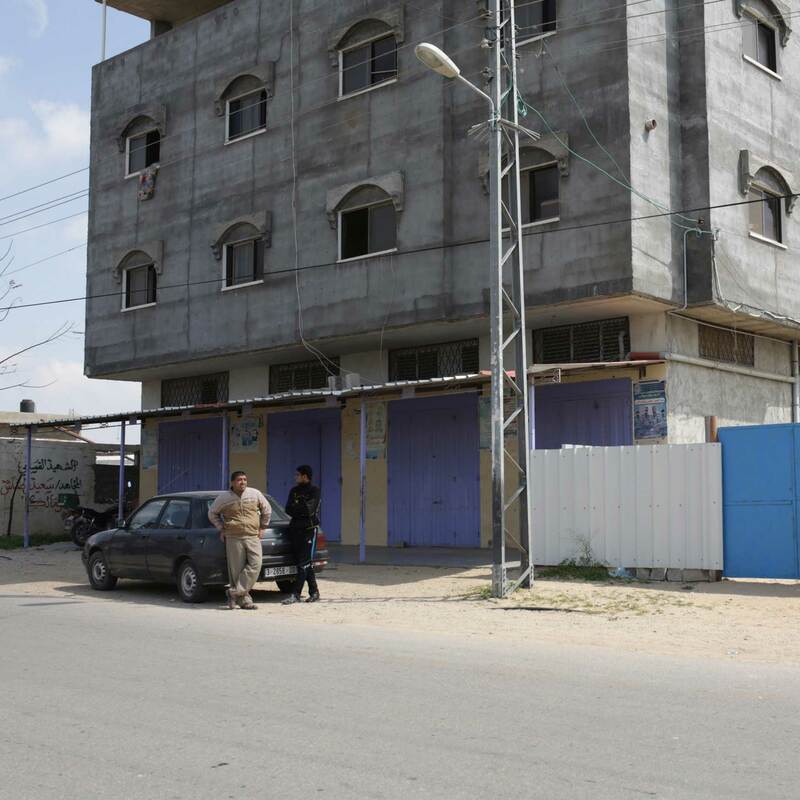 The rest of the family stayed up, chatting, joking and trying to diffuse the tension that came from the bombings getting steadily closer to their neighbourhood and Netanyahu’s promise to continue the war on Gaza. In the early morning hours, the house was shaken by an explosion. The family huddled on the ground floor. The bombs kept falling closer and closer. Masoud, Amina’s son, always trying to take on responsibility, decided to go outside, check the situation and bring around a car to evacuate the house. 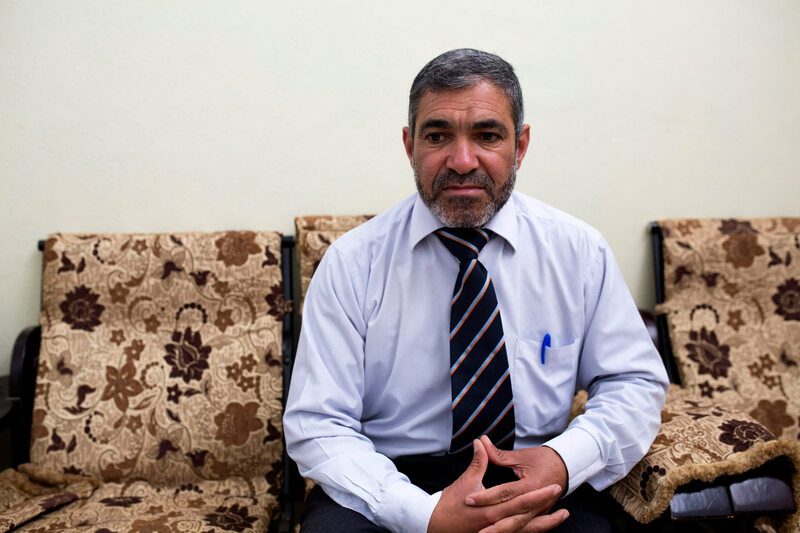 He was at the doorstep when an Israeli drone hit him with a missile. “We saw him die,” says his father. There was no time to weep over Masoud’s death. It could have been a warning before the main strike. 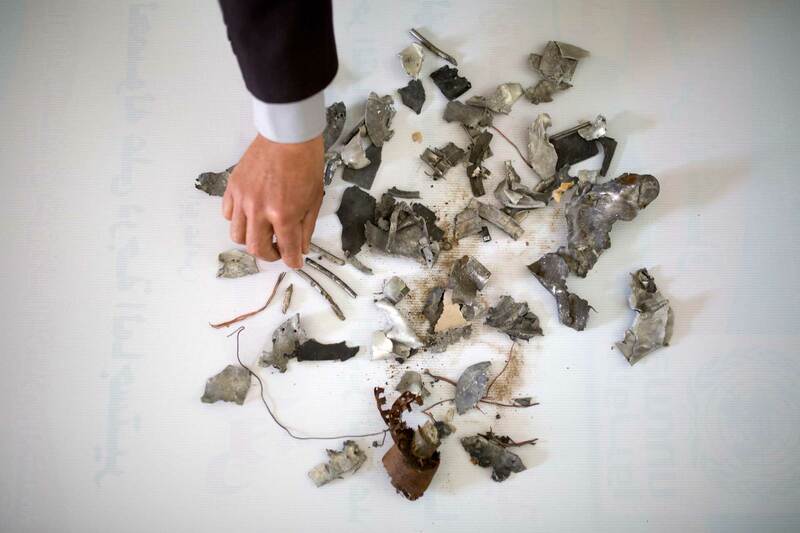 “We thought they wanted to target our home next,” says Ahmed. The family left the house as they were. Hanaa’, bound to a wheelchair by paraplegia, had to be carried. Ahmed picked her up, but after thirty meters he ran out of breath. His two sons, Said and Bilal, came to help, carrying her. 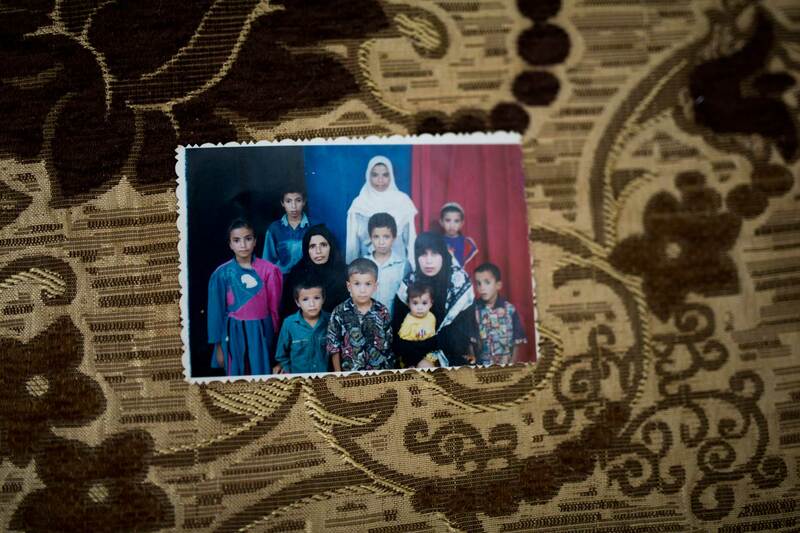 The whole family ran into the street: twelve kids, three wives, Ahmed and his elderly parents. They were hit by a drone missile barely 60 metres away from their house. Ahmed was injured. He was conscious, but in shock. “I wanted to call an ambulance, but I couldn’t move,” he says. He looked around. What he saw was a bloodbath: his loved ones injured, bleeding, scattered all around, thrown in different directions by the explosion. He ran from one person to the next, trying to check on them. A neighbour and relative, 20-year-old Mohammed, ran to help them. The minute he reached the scene, an Israeli drone fired a third missile, killing the young man. As the ambulances finally arrived, Hanaa and her sons were dying, one after the other – Ibrahim, Said, Mohammed, and their half-brother Bilal. Their little sister, four-year-old Mina, was injured. At the hospital, there was chaos and not enough doctors to take care of all of the casualties. Ahmed had to remove the shrapnel from Mina’s body himself. Hanaa’ was a community activist, a matriarch of the neighborhood. She moved to Rafah after marrying Ahmed back in 1993. There, she opened the first kindergarten in the area. It grew into much more: a center for community organizing and women’s empowerment. She named it Al-Nour, The Light, and over the years she reached out to more than 15,000 people. Then she got sick and finally lost the use of her legs; she had to use a wheelchair from then on. This confined her to the house, where she spent her days reading the Qur’an. But people never gave up on having her in their lives: they knew of Hanaa’s wisdom and often visited to ask her for advice. The kids in the family all had their successes, but Mohammed’s achievements made Ahmed and Hanaa’ particularly proud. They both had a soft spot for him, after they nearly lost him when he was nine: he was in a car accident and fell into a coma. Hanaa’ nearly lost her mind. She prayed and prayed, asking God to bring him back. He woke up eventually, but had to face a long, painful rehabilitation to restore his mobility. The accident changed him in more than one way. Although physically disabled, he blossomed from a shy kid into a young man full of life. Though he couldn’t play sports himself, this did not stop him from starting a neighborhood football team. He organized training and matches for them. The team still plays. Said was a religious young man, like his father, and involved in community life, like his mother. “He loved to have his voice heard all over the neighborhood,” Amina, Said’s step-mother recalls. Whatever happened, he would run to the mosque, if he wasn’t already there, and climb the minaret to use the loudspeaker and announce it to the neighborhood. “A missing child, a visit from a doctor, a ceremony, a memorial… and so on,” says Amina. In the afternoons, he used to come home and knock on the doors of his step-sisters to bring them chocolate or flowers, or simply to check on them, in case they needed something. 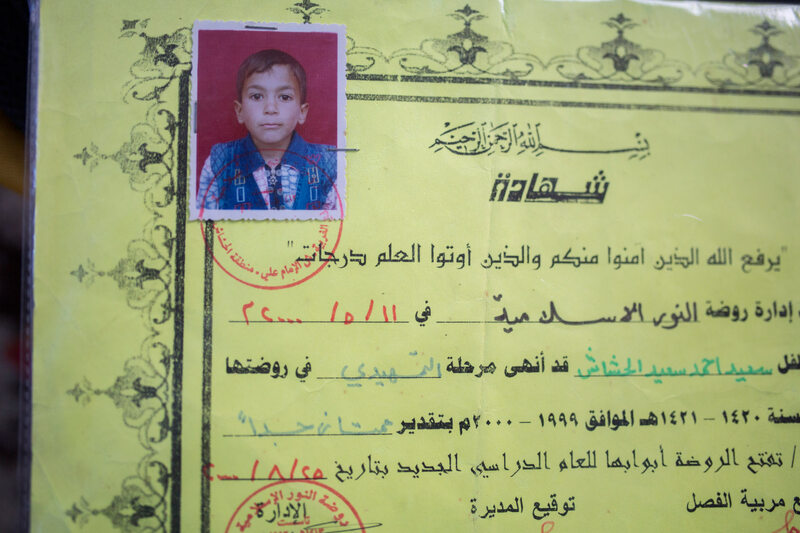 Although Bilal wasn’t Hanaa’s son, he was a lot like her: devoted to his community. The 24-year-old worked as an intern lawyer at a local committee helping people resolve their issues with the Rafah municipality. Outside of this work, Bilal and few other friends from law school took on cases from people in need who couldn’t afford a lawyer. He liked to help: it was always his first instinct. He was a cheerful 19-year-old, the eldest son of Amina. Like all of Gaza’s youngsters, he had now experienced three wars while in the prime of his life, and it was getting to him. Ramadan was about to end and normally it would have been a time for celebration, Eid al-Fitr. But it was hard to be joyful in the middle of a war; while the attacks raged, instead of wishing a friend Happy Eid, he texted him “Sad Eid” and “Eid of Martyrs”. Ahmed has a collection of photos of his sons. A week doesn’t go by without him scrolling through the pictures and sinking into the memories. 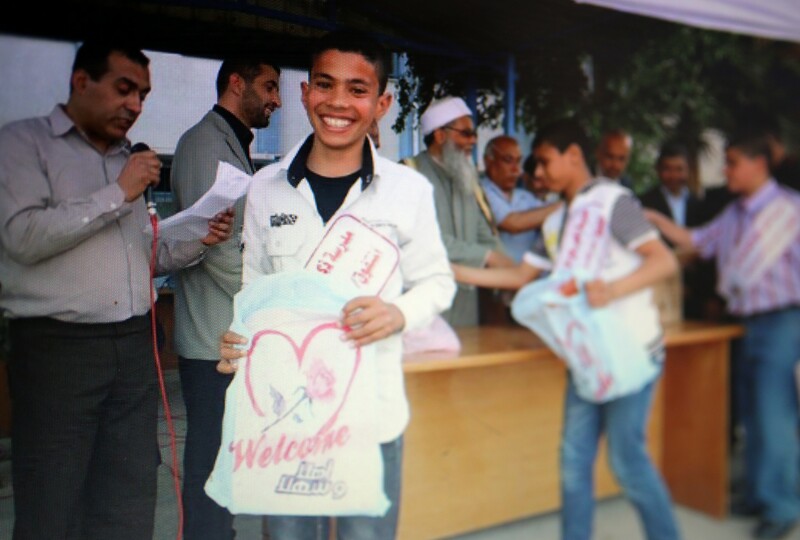 He often recalls 16-year-old Ibrahim, with his beaming smile. A bubbly teenager, his dad says, so gentle that people called him “peace dove”. 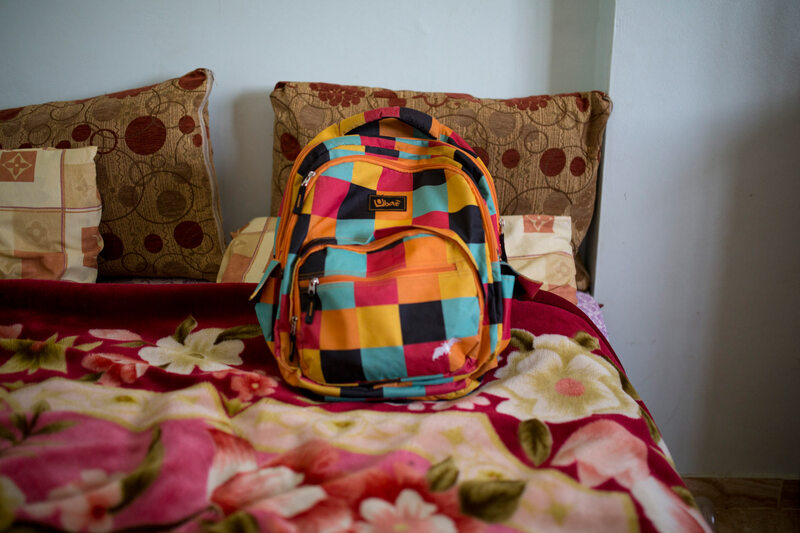 Ibrahim’s backpack. “Ibrahim loved drawing and he was really good at it” - recalled his father. 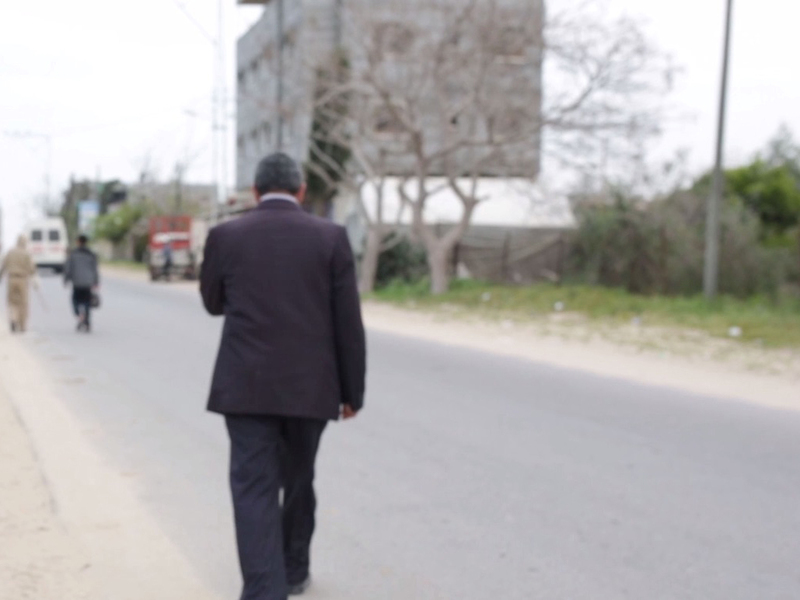 Listen to two Gazan psychologists talk about the trauma that children in Gaza face. The video is a compilation of paintings by Raed Issa, a painter from Gaza.